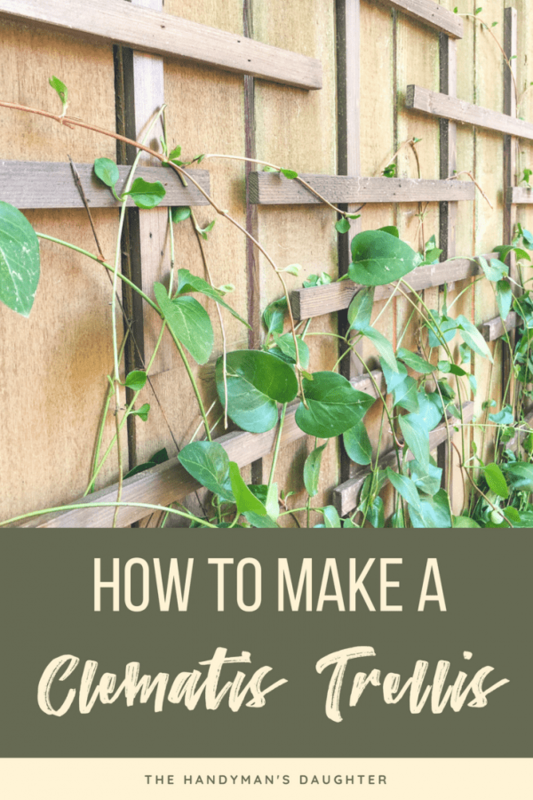 Turn that boring, flat fence into a living wall of vines with this easy to make clematis trellis! Customize your design and watch it fill with flowers! Our tall fence provides plenty of privacy in our backyard, but isn’t exactly pretty. 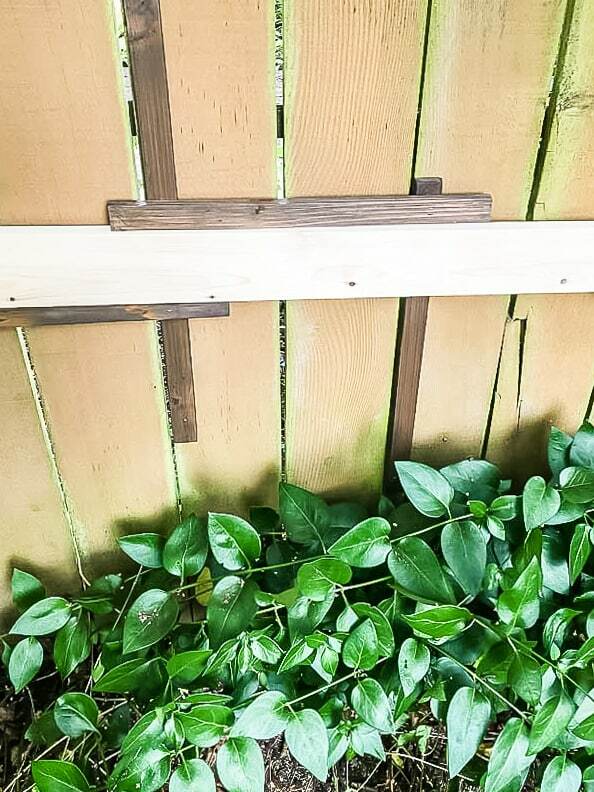 One side of the yard sports a trio of DIY garden trellises I built last year, and it worked out so well, I was inspired to create another one! 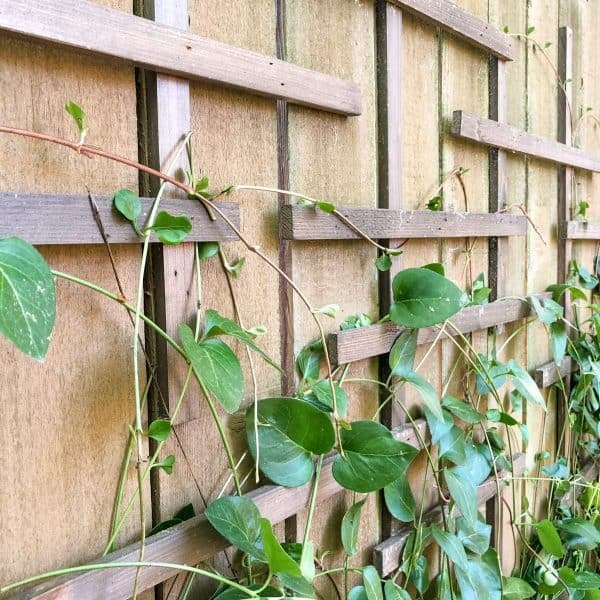 This clematis trellis helps hide the fence behind a wall of greenery and flowers for just a few dollars! 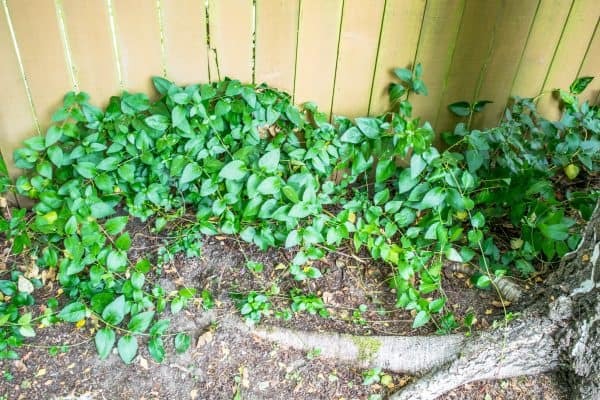 This clematis vine has thrived along the base of the fence for years. The previous owner planted it without giving it anything to climb, so it functions more as a ground cover. Without support, the vine just sits in a pile on the ground! Starting from scratch with new vines? Here’s how to choose the best climber plants for your new clematis trellis! I’m using the same cedar fence pickets as I did before, but this time I’m creating a more subtle pattern with the strips. 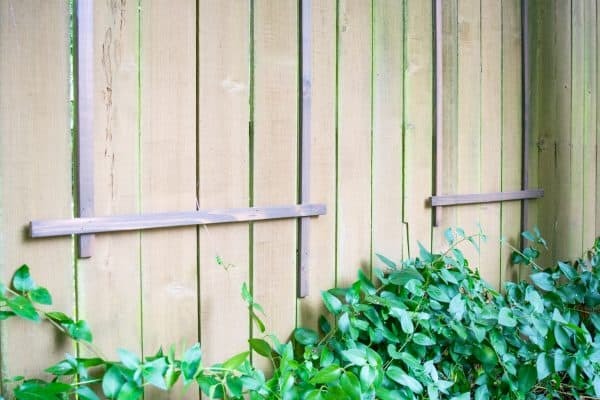 You can change up the design to suit your style, or try one of these other DIY arbor and trellis ideas! I ripped 6″ wide pickets into 1 ½” strips, but you can also use 1 x 2 cedar boards. I used Behr’s waterproofing exterior stain in Coffee to match the outdoor loveseat and sofa I made for our deck. The Ryobi Airstrike brad nailer is my personal favorite tool! Don’t forget your safety gear when working with power tools! Here are my recommendations for safety glasses and ear protection. No excuses! If you’re using 6″ wide cedar pickets, rip them down into 1 ½” wide strips lengthwise. Don’t have a table saw? Just use 1 x 2 cedar boards! Then, cut the 1 1/2″ wide strips into shorter pieces. Mine vary between 16″and 30″, so I can mix them up for a more random effect. 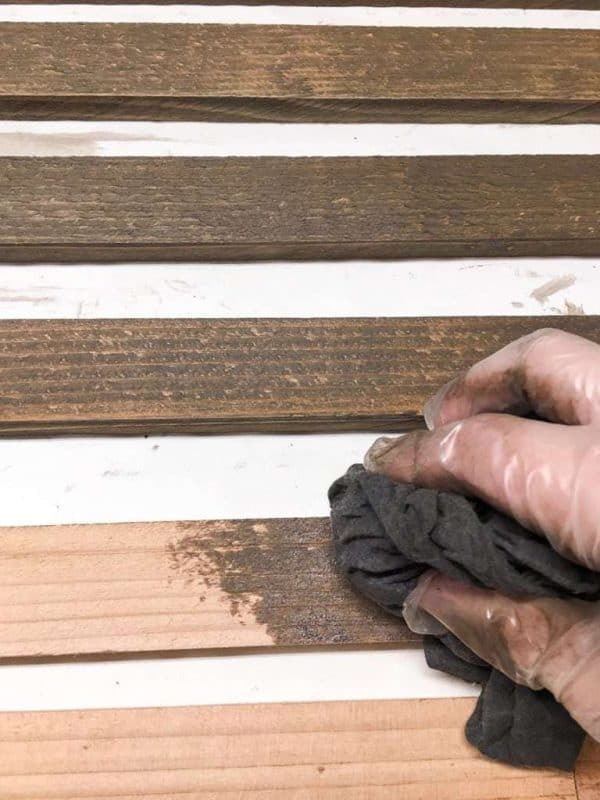 Give each piece a light sanding to remove splinters, but don’t remove all the texture. The clematis vines need something to grip onto! Stain each piece with exterior stain before starting assembly. Pick a few longer pieces to go on the bottom horizontally. First, nail one end to the vertical support. Then use the level to make sure it’s straight before securing it in place. 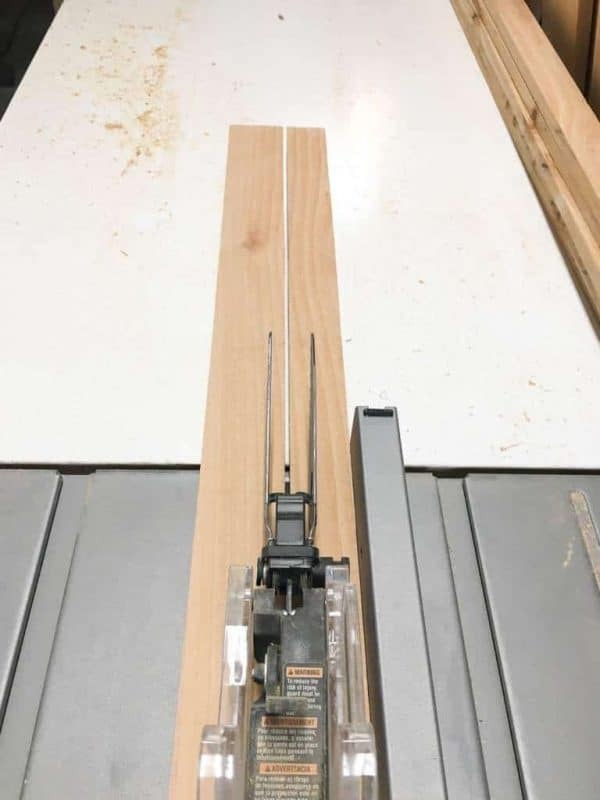 Use the 1 x 4 spacer to keep the spacing between horizontal pieces consistent and to speed up installation. I love not having to reach for the measuring tape and level every time! Decide on the placement of the next slat, then place the spacer on top of the piece underneath that spot. Add the new slat on top of the spacer and nail into place. 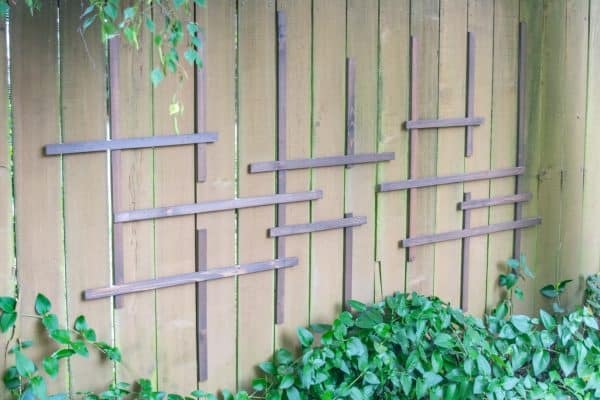 Randomly place more horizontal pieces as you work your way up the fence, making sure each slat is attached to at least two vertical supports. If the gap between two verticals is too wide, add a few shorter ones in between. As you work, step back and review your overall design. Make sure the spacing is consistent and the gaps between the horizontal pieces aren’t too big for the vines to reach. Pull off pieces and move them around if it’s not looking how you’d like. I went through a few different variations before I settled on this one! 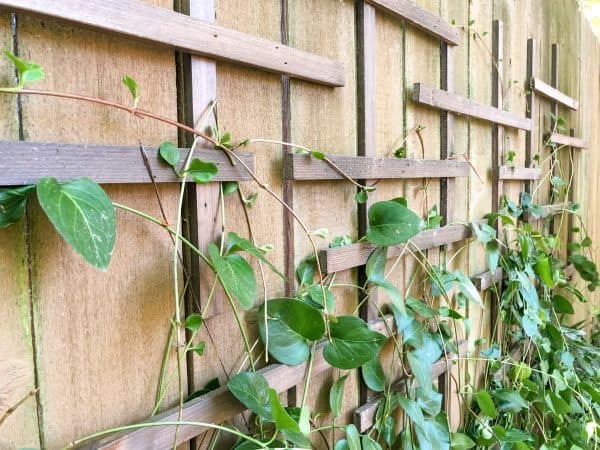 Weave the vines through the clematis trellis to give them a head start. 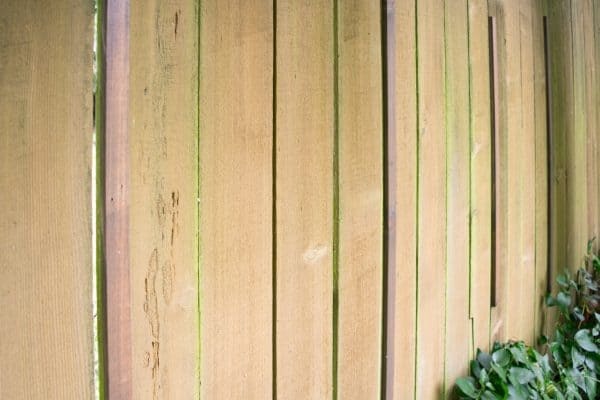 If you’re planting new plants, they may only reach the first slat. 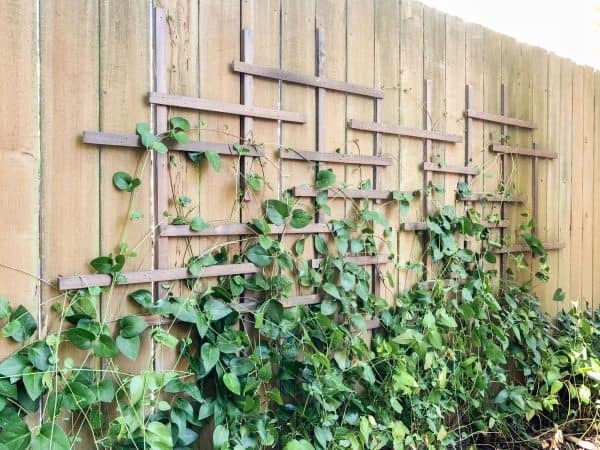 Try using trellis ties to keep them in place. Clematis grows quickly, so the entire wall will soon be covered in blooms! Now my clematis has room to spread and grow, instead of laying in a heap on the ground. 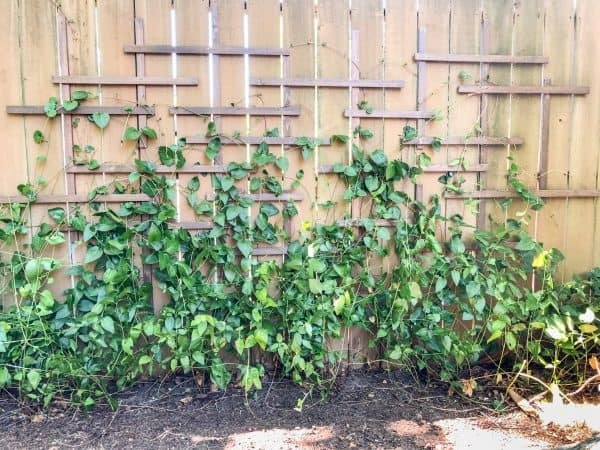 After I got most of the vines up on the fence, I pruned away the ones that were heading in the wrong direction or too far away from the fence. I gained back over a foot of space in the garden bed! I’m slowly reclaiming all the overgrown garden areas of the yard! This area gets a lot of shade, especially in the afternoon when the sun goes behind the fence. I plan to add Fuchsia, Astilbe and a few ferns I divided to fill in the reclaimed space. 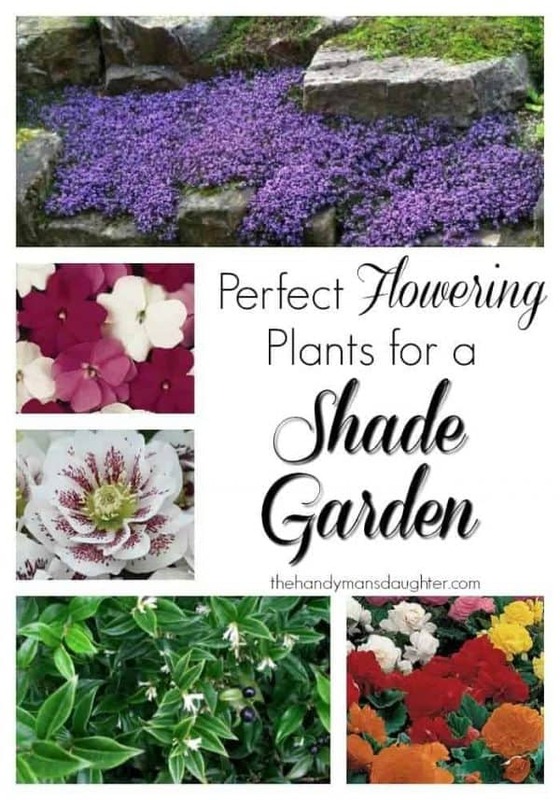 These are some of my favorite flowering plants for shade gardens! I can’t wait to see it all filled in and blooming! If you would like to keep up to date with my latest posts about gardening, outdoor projects and more, you can follow me on Facebook, Pinterest, or Instagram. You can also sign up for my email list below and get the latest post delivered to your inbox, plus exclusive access to my woodworking plans library! Hi Vineta! I love your trellis. I have been wanting to plant an autumn clematis but haven’t done so yet because I don’t have anything for it to grow on. Thanks for the inspiration. Your trellis is one of my features on next weeks OVER THE MOON LINK PARTY which goes live on Sunday evening at 5pm central. Please stop by to see your feature and link up again! Our fence is vinyl, but I use ladders and trellis’s for things to grow up. It really helps soften the starkness of the vinyl. 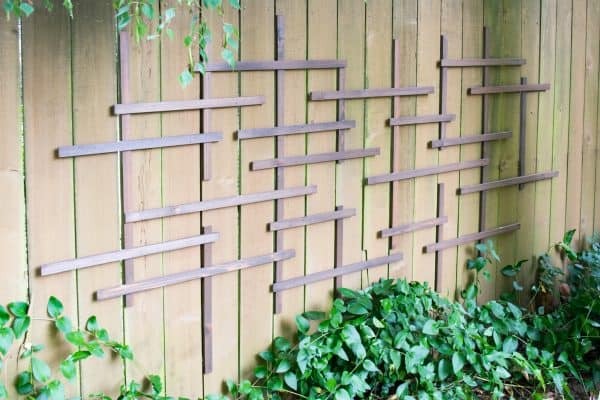 Love this trellis idea! Thanks for sharing with SYC.